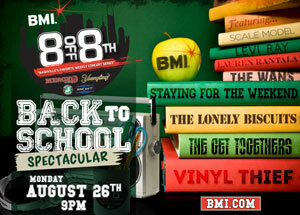 BMI has announced the lineup for this year’s edition of 8 off 8th’s Back to School Spectacular, hosted at Mercy Lounge. The free event features eight exciting up-and-coming Nashville bands playing three-song sets to the public in an exhilarating, rapid-fire show. Featured performers include: Lauren Rantala, The Get Togethers, Scale Model, The Lonely Biscuits, The Wans, Vinyl Thief, Staying for the Weekend, and Levi Ray. The event will take place on Monday, Aug. 26 at Mercy Lounge. The show starts at 9 p.m.
BMI’s involvement in 8 off 8th underscores the organization’s dedication to aspiring songwriters and artists in the early stages of their career.